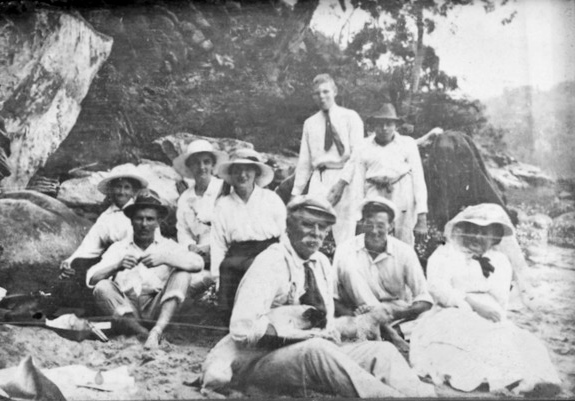 This photograph is most intriguing; it shows a group of tourists at Waratah Bay and what looks like a photographer’s cloth in the background to the right. We do know that Edward Windybank, early European settler of Cowan Creek, was promoting Waratah Bay with his enterprising business of hiring out pleasure house boats for the many people that flocked to the area on the weekends. I’m wondering if he hired a photographer to take this shot for promotional purposes, the dogs in the foreground give an extra flavour to the overall picture. Windybanks certainly did produce a number of postcards with images of the pleasure boats he built and others that show the beauty of Waratah Bay. Looking at the dress I estimate this photograph was taken circa 1910s, but I could well be mistaken. What do you think?